Sitting beside the Nile River, the building form is like a river canyon carved by the flow of Nile in the past thousands of years. It integrates with the surrounding spectacular landscape and became a new scenic point for the passing tourists on Nile. The museum is divided into two parts by an open space in the middle. Just like the Nile fertilized the both side of the ancient Egypt, the public space like a river pass through the building and form a dynamic space where people can have panorama view to Nile. Wandering in the canyon like inner space, visitors can immerse into the atmosphere of ancient Egypt and feel like exploring the real ancient relic. 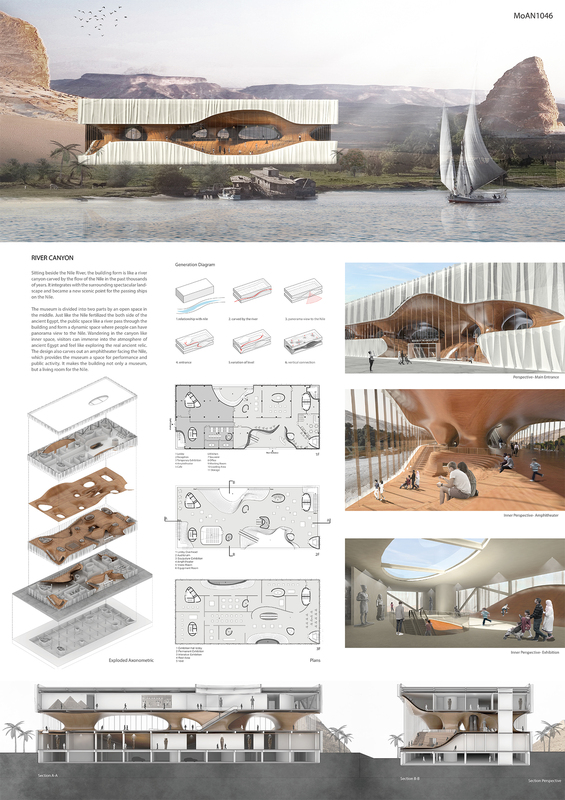 The design also carves out an amphitheater facing the Nile, which provides the museum a space for performance and public activity. It makes the building not only a museum, but a living room for Nile.